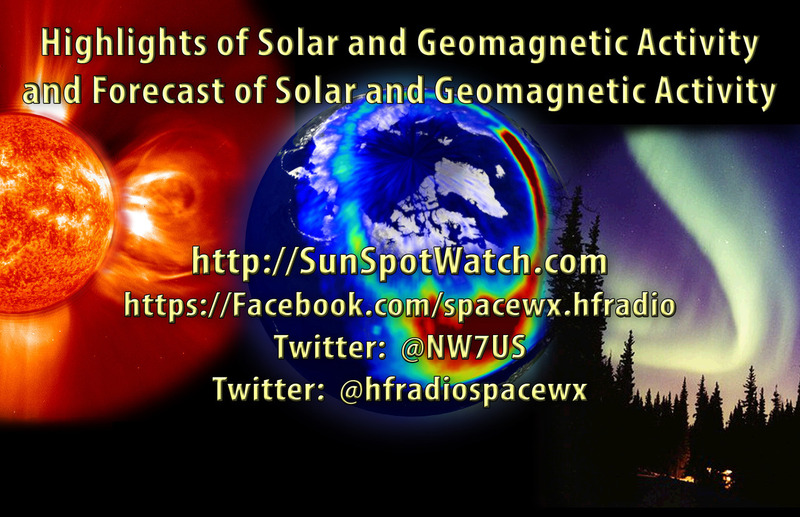 Here is this week’s space weather and geophysical report, issued 2019 Mar 25 0105 UTC. Solar activity was low throughout the period. Region 2736 (N08, L=284, class/area-Eki/420 on 22 Mar) produced multiple C-class events including a C5 flare at 21/0312 UTC. Region 2735 (N03, L=259, class/area-Cro/20 on 19 Mar) provided multiple, low-level, B-class events early in the period before decaying to plage on 22 Mar. An asymmetrical, full-halo CME was observed in SOHO/LASCO coronagraph imagery starting at 20/1100 UTC and was determined to have an earth-directed component. No additional earth-directed CMEs were observed. The greater than 2 MeV electron flux at geosynchronous orbit reached high levels on 19 and 24 Mar with moderate levels observed throughout the remainder of the reporting period. Geomagnetic field activity was at quiet to unsettled levels on 19 Mar with quiet conditions observed throughout the remainder of the period, under a nominal solar wind environment. A sudden impulse summary was issued at 24/2151 UTC for what is believed to be the arrival of the 20 Mar CME mentioned above. A 17 nT deviation was recorded at the Boulder, Colorado magnetometer. Solar activity is expected to be very low between 25 Mar-07 Apr. Low levels are expected between 08-20 Apr due to the return of Region 2736. The greater than 2 MeV electron flux at geosynchronous orbit is expected to reach high levels on 27 Mar-07 Apr with normal to moderate levels expected throughout the remainder of the outlook period. Geomagnetic field activity is expected to reach active levels on 27-28 Mar and 12 Apr due to influence from multiple, recurrent CH HSSs. Quiet to unsettled levels are expected throughout the remainder of the outlook period.